This episode, however, might be my least favorite (although I missed out on seeing the whole series the first time, and I'm about to rectify that). The Christmas-ness is oddly nonspecific, too. There are decorations in a few scenes, and the dance school is putting on The Nutcracker as their big money-maker, but no one talks about it being December. It might not actually be December, but it's not clear from the episode. The short version of the plot: the main girls in the dance class are dealing with boy drama. Boo had a crush on Melanie's brother, but he doesn't like her, he likes Ginny, who likes him, but she's best friends with Melanie. And Boo is now interested in another dance student, Carl, who she had originally brushed off. Michelle brokers some understanding between the girls. Sasha has returned after quitting dance for a while, and in the meantime Fanny has hired a semi-professional "ringer" who is creepy in her complete fixation on dance (an attitude not that different from Sasha's at the start of the show). Fanny is having trouble with her long-term gentleman friend as well. Boo manages to patch things up with her possible boyfriend, but no one else's love life goes well. Michelle's attempts to help Fanny with her love life backfire, and Melanie and Ginny return to feuding after Ginny prioritizing her friendship once over her nascent relationship causes said relationship to implode. All this stress comes to a head during the Nutcracker performance, when... ugh. It's one of those things that is supposed to be horrifying and funny, but for me just ends up uncomfortable to watch. Let's just say Michelle unintentionally injures most of the dancers and, after a startlingly abrupt dream sequence, leaves town over the girls' protests before the parents want to have her sued or arrested. 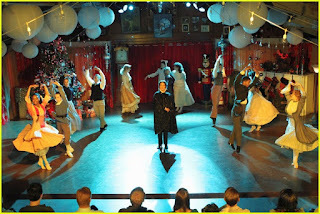 This episode does feature some lovely dancing, and Sutton Foster's powerful rendition of "Maybe This Time" during the dream sequence, which is both a call back to her first-episode desire to audition for Chicago and a thematic expression of how she sabotages everything without meaning to. Bunheads was a quirky show that wasn't for everyone, but I liked it quite a bit and wish it had gotten more of a chance.